I have talked about a lot of remedies for the body once you become injured in several of my other blogs, but prevention is something that I haven't talked about. My son got me a book for Christmas about resistance band training by Tom Brady, the football quarterback for New England. In Tom's book, he explains how he has become more agile, stronger, and overall in the best physical condition of his career even though he is older than most quarterbacks in the league. Using resistance bands is what Tom attributes the success he has had playing football at an older age. 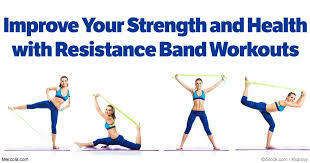 strength-training exercises using resistance bands. to fit any fitness level. many benefits you can get from what is a reinforced rubber band. can be found for under $40. bands by adding two together or doubling them up. and just add the bands to your regular moves. at all. They are portable and great for travel as well. range of motion and more. Squats: While standing with feet at shoulder distance apart, hold both handles using both hands and stretch it up to shoulder level. Do full squats preventing your hands from moving. Horizontal Chest Press: Lying on your back on the band, take both ends of it and hold it in. Slowly raise your left or right hands towards the ceiling and then bring it down slowly. Repeat the other side with the same motion. Rows: Place your left or right foot on the band while the other foot is kept at the back. Slowly bend forward until you are at a 45-degree angle. Gradually pull the band up to your waist level keeping your elbows in. Switch and do the other side in the same way. Bicep-Curl: Stand on the bad, hold both ends using your hands. Slowly curl up your hands towards your shoulders. Hold the position for a couple of minutes before going back down to your start position. Repeat the same routine. Vertical Chest Press: Get a chair, attach the band to it, and then stand on the band while your back is facing the chair. Take both ends of the band using your hands and gradually extend both hands outwards. Repeat. Overhead Triceps Extension: Sit on a chair or bench, placing the center of a tube band beneath your glutes. Grab a handle in each hand, and stretch your arms up, bending your elbows so that your hands are positioned behind your neck. With palms toward the ceiling, press your arms straight up until they fully extend. Lower back down and repeat before switching sides. Why is Strength Training so Important? Strength training will improve gone an muscle strength, which in turn will prevent falls and fractures, which are responsible for so many injuries. Strength training can also help boost your brain. Training can increase the production of growth factors, which are responsible for cellular growth, proliferation, and differentiation. This can cause the survival of neurons, which helps explain why working your muscles can also benefit your brain. Using super slow movements while training with your bands can really take it up a notch. It can have the same effect as a high-intensity interval training. These two forms of exercise may sound like opposites, super slow versus high-intensity, but the combination of slowing down your lifts and lifting to failure turns it into a high-intensity exercise that generates a cascade of metabolic adaptations that will improve your fitness level and muscle strength.